House well ventilated with balcony and 1st floor leisure area with swimming pool, with electric fence and security system. 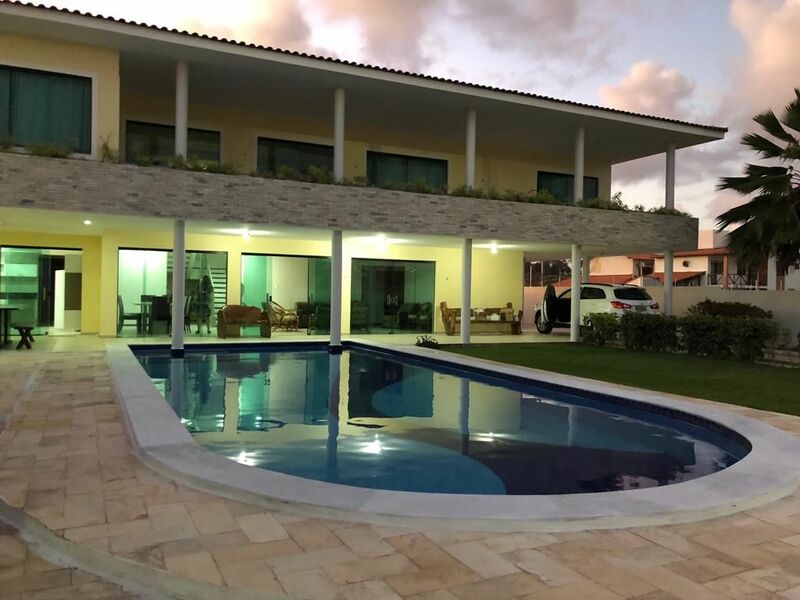 Located near the most beautiful beach of Alagoas, one of the most beautiful beaches in Brazil. Much of the beach of Barra de São Miguel has an extensive barrier reef that tans the sea, forming a huge natural pool of calm, crystalline and blue waters, with its turquoise blue color. The house has ample leisure space accompanied by a large swimming pool and swing nets for moments of rest. For sure the best place to spend your leisure time with family and friends. Barra de São Miguel also offers an area for surfers with high waves throughout the year. The house has 04 large rooms being all with Suite and accommodation for 15 people. * 01 room Dependence for maid, with bathroom. * Air conditioning in all rooms. * Complete Kitchen with: 01 Dispenser, 01 Refrigerator, 01 Freezer horizontal 1 door, 01 Freezer Vertical, Stove 05 mouths, Blender, Gelágua, Sanduicheira, Glasses, Plates, Cutlery, etc. * 02 Living Rooms with TV and sofas of 02 and 03 seats. * Electric shower in all bathrooms of the double suites. * Laser area with Barbecue. * Garage for 06 cars. * Room 01 -Bedroom (01 double bed + 01 bunk single bed + 01 closet 4PT1G + 04 pillows + 01 net). * Room 02 -1st floor (01 queen bed + 01 double bed box + 01 robe 6PT3G + 02 dumb servants + 07 pillows). * Room 03 - 1st floor (01 double bed box + 01 closet 2PT1G + 01 pillow). * Room 04 - 1st floor (03 double beds + 02 dumb servants + 01 roupeiro 4PT1G + 08 pillows). * 04 mattresses single - single.